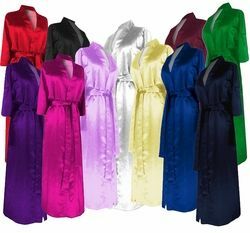 These are really pretty robes, available in sizes 0x to 9x (check measurements below!) 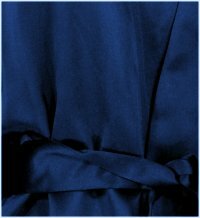 They look & feel like rich silky satin, but are a washable poly blend! It's a really pretty shiny satiny fabric, available in either dark red (burgundy), sleek black, dark blue, deep green, really red, and now available in ivory white!. It has mid-length sleeves, is open in the front, has one front pocket, and comes with a separate belt! These robes are really pretty, the pictures just don't do them justice!